As I sit here late this Sunday night (technically Monday morning) I can’t shake this soothing feeling of content that has filled my body as the result of this past weekend. Mind you, I did nothing special. I simply stayed here in Missoula and lived out a couple of normal but awesome days in God’s Country. But you see, right now is bar none the absolute best time to live in Missoula. The summer is young, the days are long, and the living is awesome. So if you don’t mind, I want to quickly recap my enjoyable weekend. On Friday night I went over to my girlfriend’s brother’s house for a big family BBQ. Paige’s sister was in town all the way from Hawaii along with her husband and two kids. Throw in Paige’s dad, her aunt and uncle, and her brother’s family and you got quite the gathering. Paige’s brother has a beautiful large backyard so we had a great time hanging out back there while eating burgers and visiting. Later in the night we all gathered around their backyard fire pit and roasted marshmallows and made s’mores. While that activity was mainly to make the four young children happy, I had just as much fun trying to make the perfect golden brown marshmallow as they did. At a little after 10 p.m. with a fair amount of daylight still in the Montana skies, we called it a night. 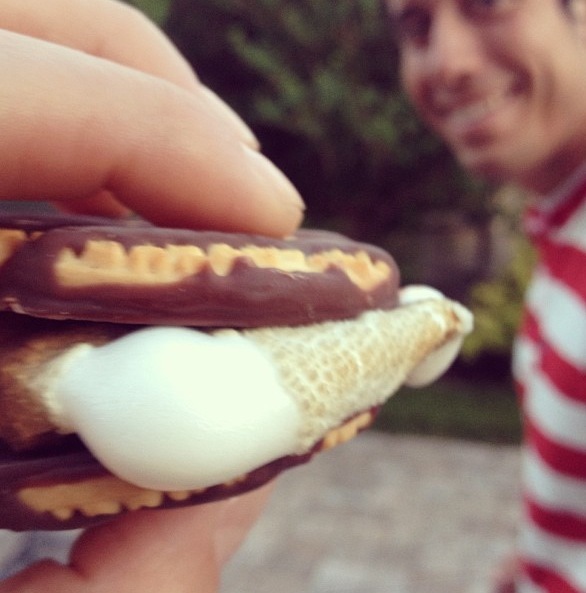 I had a great time making s’mores…and eating them! Saturday morning came and I awoke with great energy and eagerness for the busy day ahead. It all started off at Missoula’s farmer’s market at Caras Park. Paige and I walked around enjoying all the hustle and bustle of health minded Missoulians scouring the plethora of fresh produce covering tables all around the market area. When everyone from Paige’s family who attended the BBQ the previous night arrived we greeted them and I assisted in taking about a dozen different family portraits with all of their cellular devices. After the Kodak moment I walked about 100 feet over to the Missoula Carousel to cover a great event that our student-athletes were involved in. Called “Griz Day at the Carousel”, several members of our football team were on hand to sign autographs and pose for pictures with youngsters. The players even hopped on the carousel themselves and rode side-by-side with elated children who couldn’t believe that they were hanging out with Griz athletes. Our Griz football athletes helped out the community once again this past Saturday at “Griz Day at the Carousel”. After about 40 minutes at the Carousel I had to leave Downtown Missoula and head off to the next thing on my agenda. I hopped in my car and drove out to Southgate Mall where the Garden City Shootout, a 3-on-3 basketball tournament, was taking place in the shopping area’s parking lot. 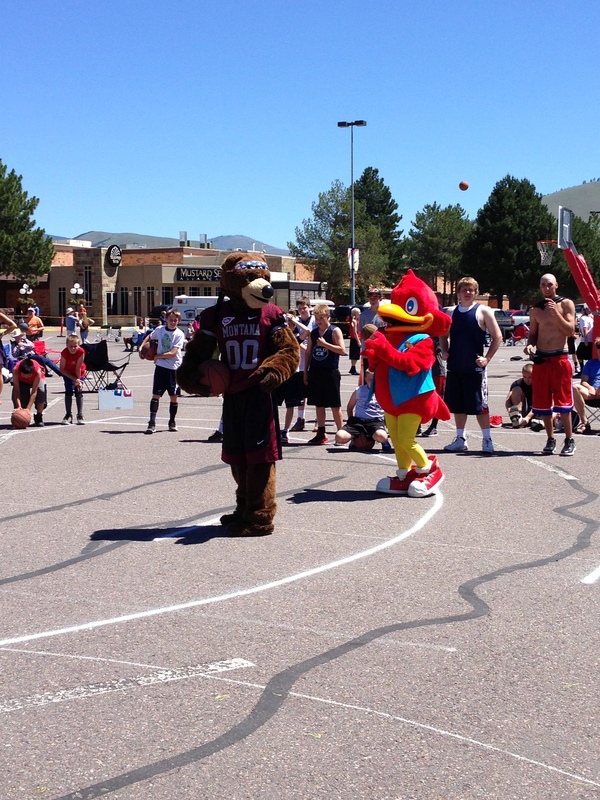 My main objective was to cover and support the best mascot in the world, Monte, as he entertained the youth at center court. He put a smile on every kid’s face as he shot baskets, sprayed silly string, and rode a bike. After about a half hour of bringing a lot of joy to the event, the mascot from Red Robin showed up and the bear and the bird played a game of Thunder with the children on hand. The silliness and fun that ensued was pretty entertaining. Monte interacting with the Red Robin mascot. When that Thunder game concluded I was off again, this time traveling to yet another different part of town to Paige’s workplace, Pattee Creek Market. The store was having a community BBQ and after not eating the whole day, I was ready for some lunch. Paige and I got a burger, chips, and drink for the low price of $2 and sat up against the outside of the store under the shade and gobbled up our food….and then went back for seconds! After we filled our stomachs Paige still had about 45 minutes before her shift was to start so we went to a nearby restaurant and had a cold drink while watching the U.S. Open. Work time then came for Paige and I returned back to my apartment where I watched the rest of the U.S. Open third round. 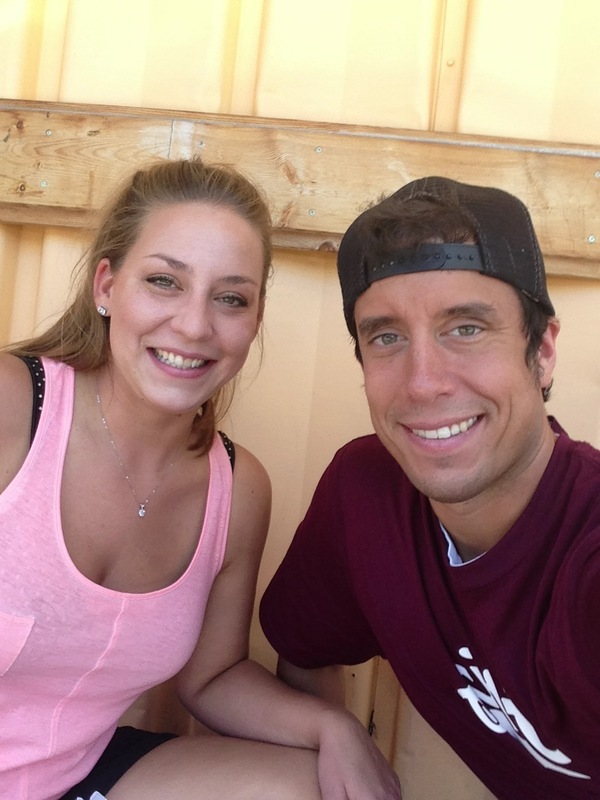 Paige and I under the shade enjoying the BBQ. I then transitioned nicely into watching Game 2 of the Stanley Cup finals and by the time that game hit overtime it was 9 p.m. and I was hungry again. I met my friend Dallas and his roommate at Buffalo Wild Wings and we watched Boston even the series at 1-1 while scarfing down some great food. Paige later joined us at the restaurant and from there we checked out a few places downtown before ending a great day. Today I rose up at 8 a.m. and read the paper and did some housekeeping items. I then hit the pool! At my apartment complex we have a pretty decent community pool area and besides just a brief time last week, it was my first time really getting to enjoy it. Paige bought us milkshakes and we had a great time getting some rays and splashing around in the water. Long after Paige had left to go to work, I myself exited the area at a little after 4 p.m., probably getting a little more sun than what I needed. Sweaty and exhausted from the heat, I settled down into my nicely air conditioned apartment in time for the last six holes of the U.S. Open. I was pulling for Phil but congrats to Justin Rose. Not long after the conclusion of the golf tournament the NBA Finals (Game 5) came on. I watched the first half at my apartment and then I went and watched the second half at the Silver Dollar where Dallas works. I took great pleasure in watching the Spurs destroy King James and the Heat to take a 3-2 series lead. I came home and did things to get ready for the upcoming work week and here I am now…writing this blog post. These are the best days to live in Missoula and I am not taking them for granted. One great weekend down, many more to come. Don’t Blink. This entry was posted in Uncategorized and tagged Buffalo Wild Wings, Caras Park, Missoula, Missoula Carousel, Missoula Farmer's Market, Paige Ulland, Pattee Creek Market, Silver Dollar by brent. Bookmark the permalink.